Take a good look at the icon below (without reading its name). Yes, the Madonna has three hands! This is a more recent copy of the “Holy Virgin of Three Hands” icon originally created in the 8th century. This work can be found at the incredible Museum of Russian Icons in Clinton, MA. Since icons are copied exactly from one version to the next, the history (or legend) surrounding this image has been perpetuated as well. During the 8th century, Byzantine Emperor Leo III set forth reforms that included the destruction of icons and other religious imagery. This Iconoclasm put Leo III at odds with St. John of Damascus who was a firm believer in images as worship aids. St. John’s text, Apologetic Treatises against those Decrying the Holy Images, clearly enraged the Emperor. As the story goes, Leo III commanded that St. John stop writing against Iconoclasm or else he would be punished. Undeterred, St. John continued and Leo III had him arrested (or framed for a crime in some accounts) and his hand cut off to put an end to further writing. St. John prayed unceasingly to the Holy Mother and miraculously regained his hand. In thanksgiving, St. John affixed a silver hand to his icon of Mary which has been dutifully copied over the last nine centuries. 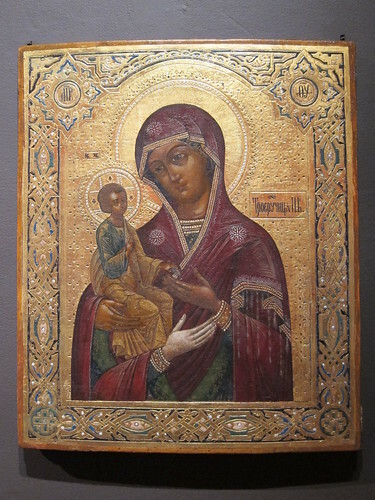 The icon above which is highly decorated with metal work may have been a traditional Madonna and Child that was adapted into the Holy Virgin of Three Hands. The imagery seems to have evolved from this into the final composition I saw the the Museum. The three painted panel examples herein are nearly identical in their composition which is what you expect from an icon – the very consistency of the image is what makes it an Icon. I especially like that the third hand is sometimes depicted with a silver shade, distinct from the other two hands. Overall, this was an interesting iconography lesson and another reminder to look critically at art. Very interesting. Did You know that In Finland ordinary people paint? What an absolutely fascinating story! !